Natural Hot Springs exist all over the world and are defined as sites where groundwater is discharged at a particular location. 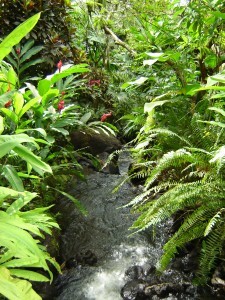 Out of all the places in the world, I was lucky enough to relax in a Costa Rica Hot Spring at the Tabacon Resort in Arenal. The amazing resort, located at the base of the Arenal Volcano, features five thermal pools for your lounging pleasure, along with several other scattered pools on the grounds. 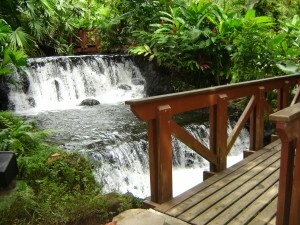 This eco-friendly Costa Rica Hot Spring resorts water flows naturally by gravity and ranges in temperature from 77 to 122 degrees. Relaxing in the springs is free if you are a guest at the hotel, otherwise it will cost you about 90 bucks for a day pass. It’s worth spending the $200 to stay the night in the hotel as well. Once we checked in we immediately headed across the street to embark on this new adventure. We were greeted at the springs by a large pool with a swim-up bar, perfect place to start our experience. I ordered one of those fruity “I have an umbrella” chick drinks that complemented the heat of the water I was waist-deep in. It would have been just as easy to spend the whole day right here, but that would not have gotten this item checked off my bucket list. We venture through what seemed like a maze of bridges each one surrounded by streaming water or rain forest foliage, in other words wherever you turned it was visually amazing. I at least dipped my toes in each one of the Costa Rica Hot Spring pools which ranged in temperature, from comfortably luke warm to “get me freakin’ out of here, I think I have third degree burns!” Don’t get me wrong, this girl loves a steamy hot tub, but at 122 degrees I couldn’t get beyond my big toe. I finally settled myself in a mid-temped spring, sat back to take in the breathtaking view and watch the toucans fly overhead. 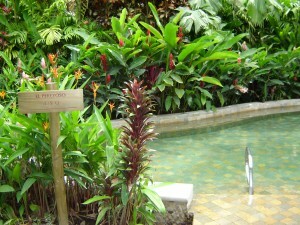 Have you been to a Costa Rica Hot Spring? We were lucky enough to relax in some hot springs when we were in New Zealand. A whole structure had been built around it and they managed the hot springs, so that you could choose from 4 different temperatures. It was really nice but that sulfur smell really never went away! Thanks for the great info! I am definitely excited to check this out for myself!